Our Living Room is still a work in progress, much like the rest of our house, but I wanted to go ahead and share a few pictures of the space. I realized recently that I don't have many pictures on here of our living room, and we spend a lot of time in here so it's about time I share it. Today I'm only sharing half of this space. That's because in order to make this area photo ready I had to shove all the the misplaced things to the other side of the room! :) There is never a moment when my entire home is clean and organized. That's pretty much impossible when you actually live in your home and you have two small children. I used to stress out about it, silly I know, but these days I'm learning to enjoy it. These are the days I will look back on and miss the most, and I really know that now. 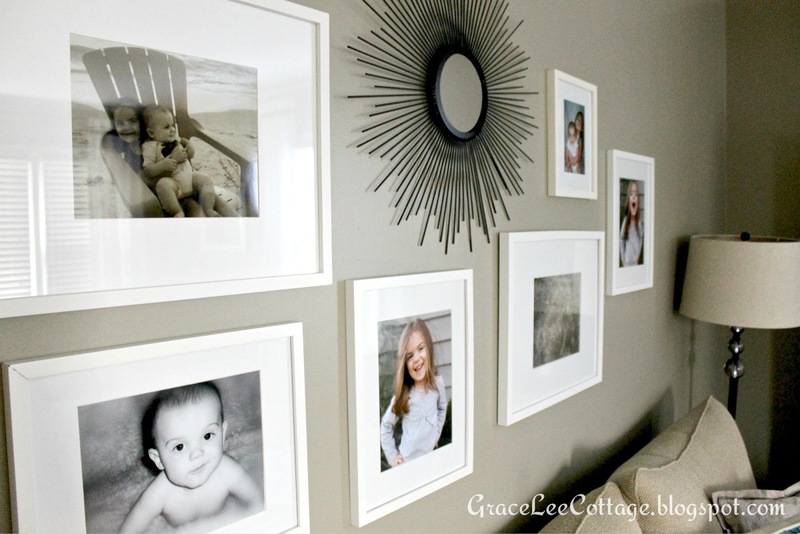 I created a gallery wall of family photos and hung a sunburst mirror right in the middle of it to add a little interest. Most of the frames and the mirror are from Target. 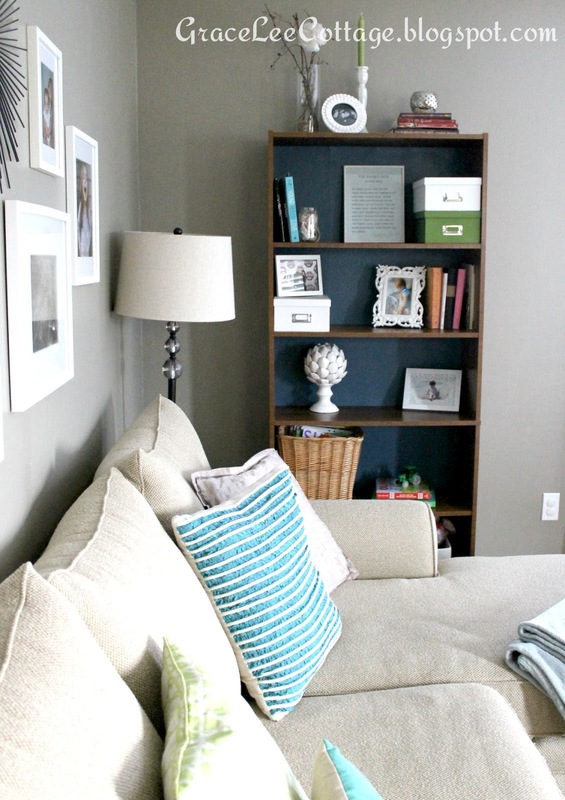 Every thing is pretty neutral in here with the exception of a few fun pillows and other accessories sitting around. The pillows are from Target, Bed Bath & Beyond, Roses, and Walmart. The book shelf once held racing trophies, but the collection is growing, so we had to find them another home in our master bedroom. Now it holds books, accessories, magazines, toys, and more! It's our everything shelf. 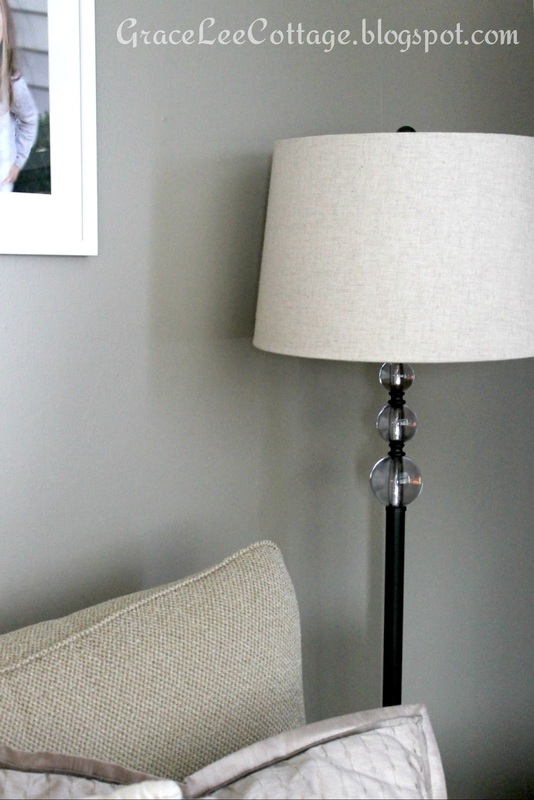 This is my little corner where I curl up and read, so I had to add a lamp. This one I bought at TJ Maxx a few years ago. I love that place! That sums up part one of our living room tour. Definitely an improvement from over 4 years ago when we bought our house. Oh and we didn't replace the paneling. We actually just filled in the seams with a putty called Vinyl Spackling. Then we sanded the walls with a sponge block, and painted. The paint color is Newsworthy Neutral by Better Homes and Gardens at Walmart. It's the perfect blend of beige and gray. Now our living room looks and feels as good as new! I will be back soon to share the other side! P.S. 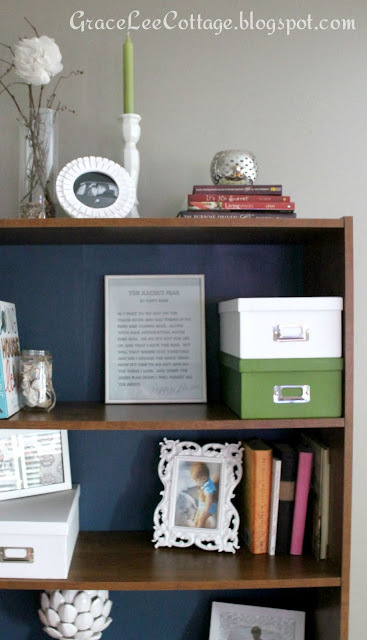 The framed blue paper sitting on the bookcase is a racing poem written by my grandfather. It's to good not to share. I think even if you are not a race fan, you can appreciate it. good and bad things in my mind keep coming back. Along with some anticipation, maybe even fear. but will that engine stay together? Did I choose the right gear? and when the green flag drops, I will forget all the above. Update: Since this post I switched out the rug and changed a few of the pillows around. Click here to read all about it. What a lovely poem! Your living room is beautiful. What a transformation! I love that poem and holy cow what a transformation!!!!! That is a great idea for covering up the panelling!!!! And I love your gallery with the sunburst!!! Great job lady!!! Such a warm sweet space!!!! Thanks Nicole! You always leave me the nicest comments! Makes my day! Hey! Thanks so much! 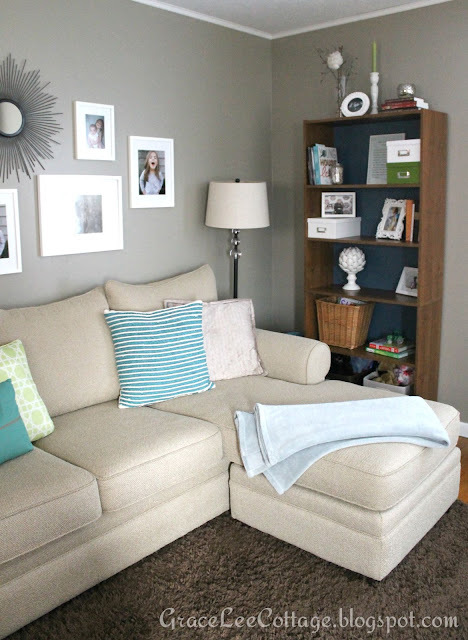 I too love the look of a white couch, but I have two small children and we use this room all the time...we are very casual and we don't have a no eating in the living room rule, so white just didn't make sense for us. :) This couch has already had everything spilled on it in the few months that we have had it, even ketchup, and I've had no trouble cleaning it at all! It's sort of a beige/gray color. The fabric has a lot of texture, but it's still very comfortable. The chase lounge can be switched to either side too which is a plus! Thanks for visiting and commenting! Best of luck with your couch search! AAAGGGHHH the dreaded paneling!!! Your paneled before pic looks almost identical to our living room & I cringe every time I'm in it. I love your redo and the colors you picked. Great idea & time/cost savor for patching the paneling. Unfortunately, ours has a very rough texture and will need to be taken out when we have our redo. Thank you for sharing! Haha! Yes! Dreaded paneling for sure! I would still love to rip those walls down and hang dry wall, but hopefully this will hold us over for a little longer! I just couldn't be patient and wait it out, so this works for now. :) Thanks for visiting! Hello! I just found your blog and I am in love! 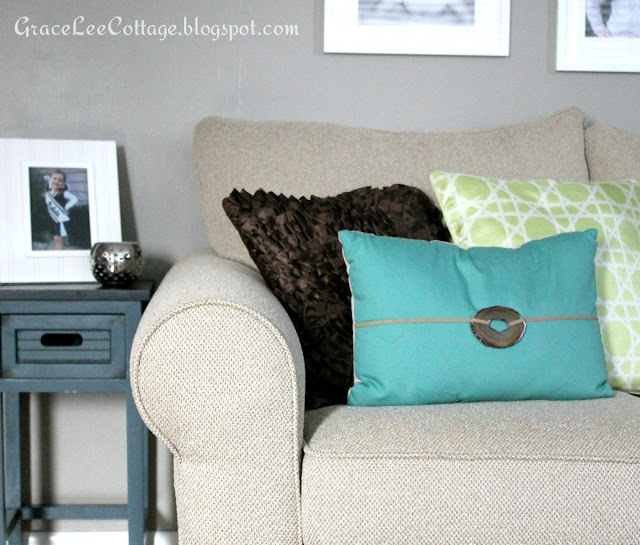 You have a beautiful home and the style is right up my alley! I love cottages as well and am slowly trying to give my own home a cottage feel. I look forward to reading more of your posts and maybe one day sharing my own blog! P.S. I ALSO have a daughter, Audrey, who started kindergarten this year!! Good luck to our little ladies! Hey Ashley! Im so glad you stopped by! Thanks so much for your kind words! That's awesome you have an Audrey in kindergarten too! How crazy! Have a fabulous day! Such a pretty gallery wall of family pictures - love how you have transformed your home from where it started! Wow!! I love this room! Where did you found your sofa? It's so bright but it looks like its pretty durable. I love white sofas I just don't know how anyone keeps them clean with children. Love all the details you put here! Hey Stephanie! Thanks so much! We love our couch! It is very family friendly but still gives the look I was going for. The brand is Craftmaster. We purchased ours at a local furniture store, but this one is very similar. Hey Nicole! It's a little time consuming but soooo worth it in the end. It was our temporary fix and here we are 5 years later with the same walls and they still look great! So glad we did it. Our kitchen/dining area walls are panelling too :) Best of luck with your new home!